Stuff I just would like to share. Over the last couple of weeks I found myself strolling down memory lane. I felt something was missing, which isn't exactly new or special. It took me a some days to realise that it seemed to be about some special playground. Being involved in Tony's book on virtual machine labs, I felt that just running some VMs on my MacBook Pro via Parallels Desktop wasn't enough anymore. After a year without a "serious" lab to tinker with, I decided to start something new. Shortly after the Intel NUC had arrived and the basic setup was ready to go, I remembered that the machine I ran my very first home lab on was still around. Putting the 12 year old DTR system next to the new "member of the family" brought back some memories of the first challenges and adventures in the Land Of The Virtual Machines. As you can see, I decided to write about the (home) labs, especially about the hardware and software involved. The beginnings lie more than a decade back. In 2004, shortly after starting a new occupation, I learned about two coworkers who had created a setup to test a virtualisation platform. 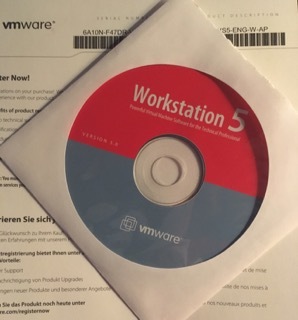 Having heard and read about VMware Workstation for a couple of months, I hadn't used it at that time. Being curious, I reached out to my colleagues to learn more about what they where "playing" with and what goals they had. They told me about VMware GSX Server and were kind enough to tell me about their plans and to keep me in the loop. Later that year, while at the company's HQ to attend some meetings, I met one of said colleagues in person. After showing me the actual setup and giving me the chance to get (some kind of) first hand experience, he handed be a book and suggested that I could take with me to have a look and return it on my next visit. 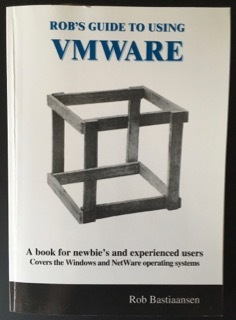 I didn't find the time back then to actually read 'Rob's Guide to Using VMware', not to mention work through it (or even parts of it), but looking back, it was the right book to find or have at the right time. It was back then when I was making up my mind about earning some certifications, and I was thinking about ways to learn about the bits I hadn't (and wouldn't have) to deal with at work. After coming across resources like Microsoft's Self-Paced Training Kits etc. and discussing options with friends and family, I decided to create my first home lab. Back then, this was enough to run Microsoft Windows XP and VMware Workstation 5, with the lab itself consisting of up to five (or even six) virtual machines (mostly Windows XP and Windows Server 2003). It was interesting (and challenging at times, of course) to find out what could be achieved using this environment, supported by some USB hubs, USB NICs and networking gear. This setup served me well for me more than three years, even (maybe even more) after successfully completing the first rounds of certifications. Mostly because of some major changes of circumstances that had quite some impact on almost all parts of my life, I almost completely abandoned this home lab platform and went for almost two years without a playground of this kind. Running Microsoft Windows Server 2012 R2, this setup proved more than just helpful in a lot of cases over the following months. With VMware vSphere 5.x running in the production environment, it was interesting and instructive to deal with Hyper-V, not only because of the differences in concepts and approaches to solutions of/within the products, but also because things needed to be transferred from one environment to the other and vice versa. It will be interesting to find out about what is possible with a setup like that, about the limitation of an environment like that (or at least those of the recent configuration), and which challenges as well as inspirations will be found along the way - floating with the machines. GU! 's not a bad egg! Renaissance Man, trying to survive in everyday life. Always curious, more often than not discerning, too. No know-it-all - at all! >:-) But seriously... Open-minded, curious & geeky, I'm allowing myself the luxury of a mind of my own. Computer all-rounder, spare-time songwriter/composer & more. My almost forgotten blog. It is still here.